The fundamental cause of alternate bearing in pecan Carya illinoinensis (Wangenh.) K. Koch is unknown, but is closely linked to the size of the dormant season carbohydrate pool. Nut yields (over a period of up to 78 years) were evaluated, for 66 cultivars, in regards to alternate bearing intensity (I). Best-fit regression analysis indicates no association between I and fruit ripening date (FRD) or nut volume; although, there was moderate association with post-ripening foliation periods (PRFP) in that I tends to decrease as the length of the PRFP decreases. Multiple regression models indicated that FRD and nut volume were poor predictors of I, however PRFP possessed significant inverse predictive power. Late-season canopy health, as measured by percentage of leaflet retention, decreased as FRD approached early-season ripening. Late-season photoassimilation rate was higher on foliage of trees with late FRDs than those with mid- or early-season ripening dates. Sprays of either Alar or ProGibb to the canopy of either trees altered return bloom the following year. These data provide new insight into the complex nature of alternate bearing in pecan and are interpreted to indicate that alternate bearing in pecan is regulated by; a) gibberellins during the time of fruit development, and b) the size of the carbohydrate pool at about the time of bud break. Alternate bearing is regarded as the economically most important biological problem of pecan husbandry in the U. S. and is largely due to the trees. nature to alternately vary, from year to year, in regards to flowers produced and/or set (Amling and Amling, 1983). Its limited study has produced two generalized theories .the .Carbohydrate Theory. (CT) and the .Phytohormone Theory. (PT) (Barnet and Mielke, 1981). Neither theory has been clearly defined in terms of specific floral evocation, induction, or developmental processes. Of the two, the CT has been most commonly advocated (Wood, 1991). It purports that flowering,and subsequent cropping, is fundamentally controlled by the tree.s dormant season carbohydrate pool. Conversely, the PT purports that flowering, and subsequent cropping, are fundamentally controlled by flower suppressing or promoting phytohormones-like substances produced by fruit and /or leaf tissues. Pecan differs in a fundamental manner from many alternate bearing crop species in that individual trees sometime bear two or three consecutive. On. crops of moderate to high yields before exhibiting a pronounced .Off. year (Sparks, 1974). Thus, alternate bearing by pecan trees can display pronounced irregularity. Publication supported by Can. Int. Dev. Agency (CIDA) of gibberellins and a growth inhibitor on return bloom of .On. and .Off. pecan trees. The Relationship of Alternate Bearing Intensity to Time of Fruit Ripening, Nut Volume, and Length of Post-Ripening Foliation Period Alternate bearing intensities (I; Pearce and Dobersek-Urbanc, 1967) in this study are from Conner and Worley (2000), who recently reported I for 66 pecan cultivars based on up to ¡Ö75 years of production data from trees grown at Tifton, Georgia (on the North America Gulf Coast Coastal Plain). 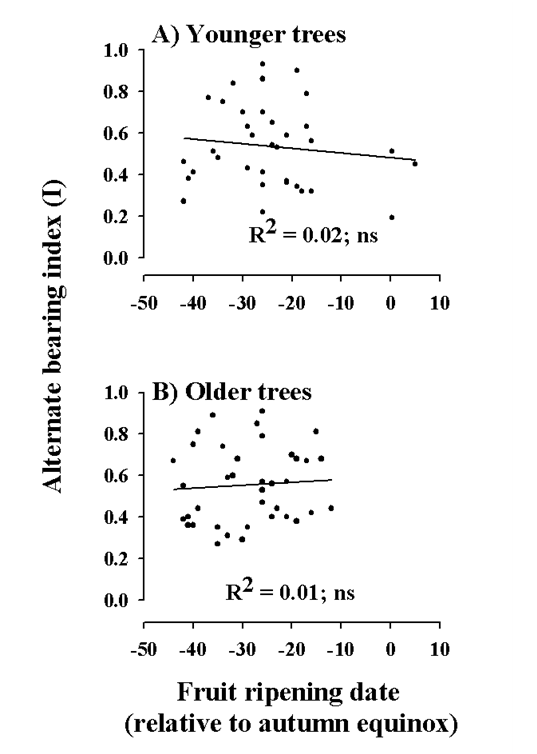 These data reflect yield performance for both relatively young trees (with data collection beginning at age 9 - 20 years) and old trees (with data collection beginning at ages from 9 to 30+ years). I was determined for young trees using yield data from age 9-20, whereas I for older trees was used based on at least 20 consecutive years of yield data from the same individual tree. These trees received commercial-like cultural and pest management inputs typical of those in the southeastern U.S. during the life of the trees. These same trees were measured in the autumn of 2001 for date of fruit ripening (date when 50% of fruit exhibited split shuck sutures; FRD), post-ripening foliation period (date of 75% canopy defoliation minus date of fruit ripening; PRFP), and in-shell nut volume (based on 100 nuts per tree). Alternate bearing intensity indexes, or I ( I = 1 means there is no yield in alternating years and I = 0 means there is no difference in yield from year to year; values < 0.3 are much more desirable than those > 0.5) were regressed against FRD, PRFP and nut volume for trees of two age classes: i.e., .younger. trees (i.e., calculations based on yields from 9 to 20-years-old trees) receiving fungicide sprays for the control of pecan scab; and .older. trees (i.e., calculations based on nut yields from trees 9 to 30+ years-old trees) receiving the same fungicide sprays for the control of pecan scab. 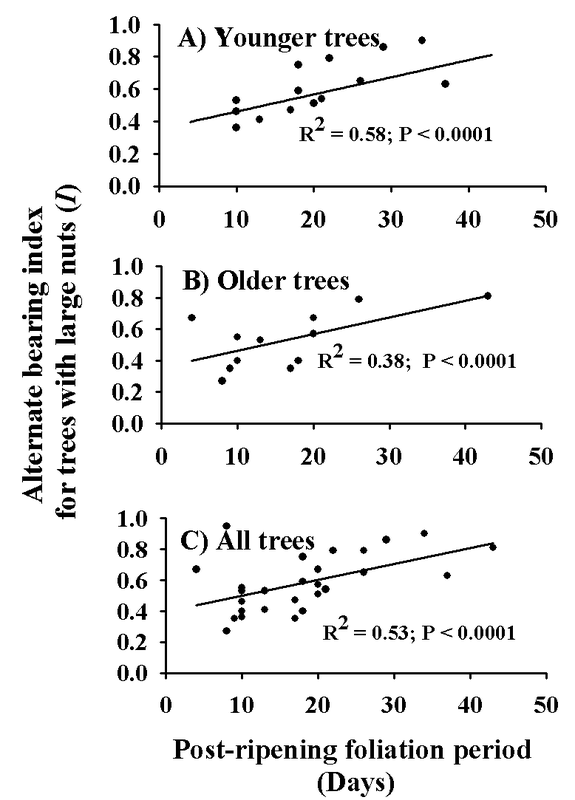 Nut volume tends to be stable, within a genotype, when mature trees receive good culture (Sparks, 1992). The cultural and pest management programs used on these trees through the years varied, but were generally conducted according to Georgia Cooperative Extension Service recommendations for commercial pecan orchards. Copious anecdotal evidence indicates that the magnitude of alternate bearing intensity is a relatively stable defining characteristic of a particular cultivar (eg. .Desirable. typically exhibits a low I (< 0.3) whereas .Chickasaw. exhibits a high I (>0.5), regardless of where or how the cultivar is commercially cultivated); and that relative differences in alternate bearing severity between any two cultivars tends to be highly similar in commercially cultivated orchards. Thus, the above described relationships between I and FRD and PRFP was also tested for a second cultivar population. Fruit ripening date and leaf fall data from this nearby site (i.e., Byron, Georgia; about 140 km from Tifton; also on the Gulf Coast Coastal Plain, and also in the same USDA Plant Cold Hardiness Zone of 8a) were collected over a five-year period (Wood et al., 1997). The two locations are nearly identical with regard to both elevation, climate, weather and cultural practices. Additionally, several years of observations by the authors indicated that both absolute and relative FRDs vary little between the two locations. Data were analyzed with the SAS statistical system (SAS Institute, Cary, N.C.) for linear, quadratic, and cubic regression components and for best-fit multiple regression models. This cultivar population was segregated into two nut volume classes before regression analysis of I against PRFP. Cultivars were segregated into .large. [those at least as large as .Stuart. (> 13.5 cm3)] and .small. [those smaller than .Stuart. (< 13.5 cm3)] volume classes. FRD). They were again evaluated on a single date in mid-November for canopy health based on the percentage of leaflets remaining on shoots (% of total leaflets remaining on 10 shoots, randomly sampled 3 m above the ground on the eastern side of the canopy). FRD and canopy health were regressed using SAS as described above. Foliage photoassimilation rates (A) of trees with FRD=s, ranging from one week prior to the autumn equinox to about six weeks afterwards, were also measured from the above described cultivar collection. A was measured on the apical-most leaflet of the apical-most compound leaf on three randomly selected terminal shoots 2 m above the ground on the eastern side of the canopy. Measurements were taken from 0900 to 1200 h using a LI-COR 6400 (LI-COR, Lincoln, NB.) portable open-system photosynthesis apparatus (Wood, 1988). Measurements were made at a photosynthetic photon flux of 1,500 umol . m-2 . s-1, at ¡Ö 400 ug.g-1 CO2, on attached foliage from trees receiving ¡Ö 50 L water per day via drip irrigation. A was regressed against fruit ripening date using SAS regression techniques as described above. The canopies of alternate bearing .Pawnee. trees were sprayed in mid August, late August, and mid September with either Alar or ProGibb (Gibberellic Acid; Abbott Laboratories, North Chicago, Illinois, U.S.). Due to a limited supply of trees, two . On. trees were sprayed in 2000 with ProGibb at 150 ug.g-1 and two A Off. trees were sprayed with Alar (Daminozide; Uniroyal Chemical, Middlebury, CT) at 500 ug.g-1, and two A On. or A Off. control trees were left unsprayed. These same trees were assessed for return bloom the following year by counting the fruit per 100 shoots on the southern exposed lower canopy of the tree. The mean number of fruit per shoot was then determined by counting randomly selected fruiting shoots in June, 2001. Alternate Bearing as Related to Ripening Dates of Cultivars I of the .younger tree. or .older tree. population of cultivars at the Tifton orchard reflected FRD=s ranging from 5 days before the equinox to 42 days after the equinox (a 47-day range) (Fig. 1-A); whereas the .older tree. population consists of cultivars ripening from 11 days after the equinox to 43 days after the equinox (a 32-day range) (Fig. 1-B). These dates encompass > 90% of the variation in ripening dates exhibited by pecan cultivars (Sparks, 1992). There was little or no linkage between I and FRD (R2 < 0.02, and P > 0.20), regardless of tree age class (Fig. 1). These data indicate that the nature of genetic control over alternate bearing is such that its intensity, I, is only loosely linked to date of fruit ripening. For example, .Moneymaker. and .Barton. are early ripening genotypes, yet I values were much greater than .Sumner. and .Farley., which are late ripening genotypes. Other evidence supporting a weak genetic relationship between I and FRD is the observation (by the senior author) that a well-tended tree exhibiting unusually early fruit ripening (in Jaumave, Tamaulipas, Mexico; ripening in mid-July, about 60+ days ahead of most cultivars and about 120 days before leaf fall) also exhibits severe alternate bearing. Because alternate bearing is not necessarily diminished in early-ripening genotypes, breeding efforts to effectively overcome alternate bearing must also include additional traits. Alternate Bearing as Related to Duration of Post-Ripening Foliation Period of Cultivars Regression analyses indicated that 23% of the variation in I of the younger tree population was positively associated with length of the PRFP (Fig. 2-A). Thus, the shorter the post-ripening period, the less the intensity of alternate bearing. This relationship between I and PRFP was even stronger (with PRFP accounting for 43% of the variation in I) in the .older tree. population (Fig. 2-B). Analysis of cultivars in common between the Tifton orchard and the Byron orchard (i.e., having 5 years of data on the length of the post-ripening foliation period of several cultivars) confirmed the relationship between I and PRFP as described above (data not shown) and the lack of relationship between I and FRD (data not shown). When these cultivars were segregated into (small nut volume. vs. .large nut volume. classes and the relationship between I and PRFP determined, there were only slight associations (R2 < 0.11; P > 0.30) with .small nut volume. cultivars in either the .younger tree. or the .older tree. opulations (data not shown). However, with the .large nut volume. population there was a much stronger association between I and PRFP for .younger., .older., and .all. tree populations (Fig. 3). In the case of the .younger trees., 58% of the variation in I was positively associated to the length of PRFP (Fig. 3-A), whereas 38% was associated in the .older tree. population (Fig. 3-B). Again, if cultivars possess large nuts, the longer the post ripening foliation period the greater the intensity of alternate bearing. There was a much weaker relationship with cultivars possessing small volume nuts. Thus, these observations involving data from two different orchards and tree populations agree with each other in regards to the association between .I and FRD¡± and .I and PRFP¡±. An evaluation of the .younger. and .older. populations of cultivars for the relationship between I and nut volume revealed an absence of linear or quadratic associations within either the .younger. or .older. tree populations (Fig. 4). Thus, breeding efforts to minimize I must necessarily take into account factors other than nut size (i.e., possibly nut-set per cluster, percentage of fruiting shoots, oil content of kernels, leaf area to kernel mass ratio, leaf photosynthetic efficiency, etc.). Incorporation of all combinations of FRD, PRFP, and nut size as independent variables in multiple regression models failed to generate a model possessing reasonable statistical significance (i.e., P > F = < 0.20; models not shown) for predicting I. This was true for both .younger. and .older. tree populations. However, it is noteworthy that PRFP was much more predictive than were FRD or nut size. Thus, models for prediction of alternate bearing intensity must also include traits not evaluated in this study (i.e., perhaps nut cluster size, oil content of kernels, photosynthetic efficiency of foliage, leaf area to fruit mass ratio). Canopy health, as measured by the percentage of foliage present in the lower canopy in mid-November, was closely associated with the date of fruit ripening (Fig. 5-A). About 52% of the variation in canopy health was associated with FRD, with health increasing with latter fruit ripening dates. Cultivars ripening fruit early in the fruit ripening period (about the time of the autumn equinox) exhibited canopies that were largely defoliated by mid- November, whereas those ripening fruit late in the fruit ripening period (i.e., 6 - 8 weeks after the autumn equinox) exhibited canopies that were well foliated. When specimen leaflets of the lower canopy were measured in mid-November for photoassimilation rate it was discovered that .A¡± declined in a curvilinear manner as FRD approached the autumn equinox (Fig. 5-B). About 76% of the variation in A was associated with FRD. Foliage from trees exhibiting late-season fruit ripening possessed A rates 3 to 5 fold greater than rates of foliage from trees ripening fruit around the time of the autumn equinox. Thus, late ripening cultivars tend to maintain more canopy later in the growing season and also maintain a higher rate of photoassimilation than do early ripening cultivars. Treatment of either .On. or .Off. trees in 2000 with ProGibb resulted in almost no fruit being produced in the following .Off. or .On. years (Fig. 6). Conversely, the .On. trees treated with Alar in 2000 produced more nuts than did the control or the ProGibb treatments in the following .Off. year in 2001. Those .Off. trees treated with Alar in 2000 returned with a good crop in 2001, yet the ProGibb treatment failed to produce many fruit per shoot. These data indicate that ProGibb acts to suppress flowering the following year and Alar acts to enhance flowering the following year. These data provide new and unexpected insight into alternate bearing of pecan. Although not a critical test of the two predominate theories of alternate bearing, these data illustrate phenomena to which a viable theory must be reconciled. Thus, the two prominent theories merit an evaluation within the context of these findings. The CT purports that it is the magnitude of the trees carbohydrate reserves that controls flowering, crop set, and variations in alternate bearing. This theory is derived from observations showing that: a) cropping is closely linked to dormant season assimilate reserves, especially those in roots (Waugh and Smith, 1936; Smith and Waugh, 1938; Sparks, 1974; Worley 1979a, 1979b; Wood, 1989); b) reductions in canopy health or longevity, enhance the intensity of alternate bearing, whereas long-lived and healthy canopies result in greater return fruit set (Hinrichs, 1962; Worley 1979a, and 1979b); c) crop-set by certain early ripening cultivars is greater than that of certain late ripening cultivars when crop load is thinned in the previous year (Smith et al., 1986); d) trees and limbs appear to possess a certain source:sink (leaf:fruit) equilibrium that exhibits a relatively low alternate bearing intensity (Wood, 1991); and e) there is a high positive correlation between fruit set and growth of shoots and leaves (Gossard, 1933); and f) return bloom is often only mildly reduced in crop years following a large nut crop largely devoid of kernels (Davis and Sparks, 1974). Thus cultural and pest management practices enhancing canopy health and retention usually reduce alternate bearing intensity, but do not eliminate the cycling phenomena (Conner and Worley, 2000). The CT functions well as a .conceptual tool. and is a basis on which husbandry practices are based. It is commonly accepted, in the case of pecan, that alternate bearing is tightly linked to; a) date of fruit ripening relative to the length of the growing season, b) duration of kernel filling, and c) lipid content of kernels (Sparks, 1974). Pecan fruits typically ripen > 40 days later than most other deciduous trees (Sparks, 1974), during the last one-third of the growing season. During this time photosynthetically active radiation levels rapidly decline as leaves senesce and abscise in preparation for winter (Wood, 1988). Conversely, the PT identifies phytohormones as the primary factor(s) controlling flowering, crop set, and alternate bearing. The PT (Barnet and Mielke, 1981) is supported by observations that: a) return bloom is usually inversely related to the size of the previous crop, with return bloom becoming greater as the duration of the presence of developing fruit diminishes (even prior to the initiation of cotyledon filling) (Wood, 1989); b) the removal of fruit during .late water stage. (immediately prior to the initiation of significant kernel filling) of development has a large positive impact on return bloom before there is significant deposition of kernel dry weight ( Crane et al., 1934; Wood, 1989; Smith and Gallot, 1990; Reid et al., 1993); c) water stage fruit contain substantial amounts of gibberellin-like substances (Wood, 1982), a phytohormone known to inhibit flowering in certain other tree species (Greene, 2000) [Thus serving as the basis of the pecan management practice of mechanically reducing crop load in which kernels exhibited little or no development (Smith et al., 1986; Smith and Gallot, 1990; Reid et al., 1993)]; d) shoots, branches, and limbs can cyclically bear on opposite cycles (Wood, 1991); e) there is little or no difference in concentration of total carbohydrates within one-year-shoots where flowers are produced for the following crop season (Smith et al., 1986; Wood and McMeans,1981); and f) pistillate flowers are physiologically differentiated by early August (i.e., 2 - 3 weeks before the initiation of kernel filling) of the year preceding their initiation (Amling and Amling, 1983; Wood 1995). The classical PT attributes year-to-year variations in flowering, crop-set, and alternate bearing intensity, to one or more flowering inhibitors produced by developing fruit and/or foliage. It is noteworthy that regardless of the mechanism controlling alternate bearing, physiologically differentiated pistillate flowers require vernalization if they are to develop into flowers the following growing season (Amling and Amling, 1983). Data from the present study do not necessarily disagree with the CT, but it does require revision of thinking, in regards to how carbohydrate reserves may be regulated in pecan. The CT implies that, for a diverse population of cultivars, there should be a strong statistical linkage between alternate bearing intensity and factors that either enhance or 622 prevent the buildup of carbohydrate reserves in storage tissues during the dormant season. Thus factors such as date of fruit ripening and duration of the post-ripening foliation period, especially for large nut-size cultivars, would be expected to be closely linked to alternate bearing intensity due to their perceived likelihood of influencing carbohydrate reserves. The present study indicates little or no linkage between I and FRD, yet at least a moderate linkage with PRFP. Curiously, this linkage is opposite of that commonly perceived -in that cultivars with a short PRFP tend to exhibit the least degree of alternate bearing and those with a long PRFP exhibit a higher I. The above described data on canopy health and photoassimilation indicates that this I-PRFP linkage could be attributed to a greater photosynthetic output of the tree.s canopy. Trees ripening fruit in late season also tended to retain the canopy and have higher late season photoassimilation rates than those ripening in early season. Therefore, early fruit ripening appears to advance the initiation of leaf senescence (especially from the standpoint of photoassimilation) and late fruit ripening appears to delay or retard the onset of senescence. Thus, trees with a short PRFP may possibly benefit from a greater accumulation of assimilate reserves in storage tissues which influence flower initiation or development. This explanation is supported by the observation that fruit enhance net photosynthesis and delay senescence of adjacent foliage of pecan (Wood, 1988). Thus, the CT is not necessarily inconsistent with these results. However, the lack of relationship between I and in-shell nut volume, and the associated greater sink mass of large volume nuts, remains paradoxical unless the ability of the tree to satisfy the carbohydrate storage pool in the tree is largely unrelated to the magnitude of the demand of developing nuts for photoassimilates. Additionally, this lack of effect of large sized nuts (with large kernels) on I is evidence that the enhancing effect of mechanical fruit thinning, at the beginning of kernel filling, on return flowering and fruit-set is not solely related to the alleviation of kernel demand for photoassimilates, and may indeed be unrelated. When these data are reconciled with the existing PT, there are both consistencies and inconsistencies. The lack of association between I and FRD is consistent with the existing theory in that the action of a fruit produced hormonal floral inhibitor is likely to be essentially independent of the time of fruit ripening. There is inconsistency in that cultivars with a short PRFP tend to have at least a moderate linkage to I and to extended canopy health and photoassimilation. Thus, the classical PT, in which phytohormone-like flowering inhibitors putatively function as the sole regulator of alternate bearing, appears untenable. However, the observation that ProGibb suppressed flowering in both .On. and .Off. trees, indicates that gibberellins play a key role in the alternate bearing process and act to either prevent floral induction or suppress development. The positive effect of Alar on flowering is also indicative of a likely role for gibberellins, as Alar is thought to interfere with gibberellin related physiology. These results indicate that the classical PT explaining flowering in pecan is probably invalid unless there is a late-season flowering promoter produced by non-senescing late season foliage and/or by developing fruit. Either way, the generalized classical theory requires revision. Results also require that the classical CT be revised to explain how I is unrelated to nut size and is not substantially moderated by a long post-ripening period of foliation and is also substantially reduced by a short post-ripening foliation period. These results indicate that alternate bearing in pecan is best explained by a model synthesizing aspects of both theories; to include key regulatory roles for both phytohormones and carbohydrates. We, therefore, hypothesize that regulation of alternate bearing in pecan is a two-step process, with the first step being via hormones produced by fruit and shoots (including foliage), and step two being via the size of the dormant season carbohydrate pool available at bud break. These findings also impart a degree of importance to the effect of late ripening dates for maintaining canopy health that was previously unrecognized. It also points out a major problem with the concept that alternate bearing will be substantially moderated by ensuring a long post-ripening foliation period solely via usage of early ripening cultivars. Amling, H.J. and Amling, K.A. 1983. Physiological differentiation of pistillate flower of pecan and cold requirements for their initiation. J. Amer. Soc. Hort. Sci. 108:195-198. Barnett, J. and Mielke, E.A. 1981. Alternate bearing: a re-evaluation. Pecan South. 8:20-30. Conner, P.J. and Worley, R.E. 2000. Alternate bearing intensity of pecan cultivars. HortScience. 35:1067-1069. Davis, J.D., and Sparks, D. 1974. Assimilation and translocation patterns of carbon- 14 in the shoot of fruiting pecan trees, Carya illinoensis Koch. J. Amer. Soc. Hort. Sci. 99:468-480. Conner, P.J. and Worley, R.E. 2000. Alternate bearing intensity of pecan cultivars. HortScience 35:1067-1069. Crane, H.L., Hardy, M.B., Loomis, N.H, and Dodge, F.N. 1934. Effect of nut thinning on size, degree of filling, and annual yields of pecans. Proc. Amer. Soc. Hort. Sci. 32:29-32. Greene, D.W. 2000. Reducing floral initiation and return bloom in pome fruit trees--applications and implications. HortTechnololgy 10:740-743. Gossard, A.C. 1933. The importance of maintaining vigorous terminal growth of pecan trees. Natl. Pecan Assn. Bul. 32:84-89. Hinrichs, H.A. 1962. Pecan industry and some research developments in Oklahoma. Annu. Rpt. Northern Nut Growers. Assn. 53:80-85. Pearce, S.C. and Dobersek-Urbanc, S. 1967. The management of irregularity in growth and cropping. J. Hort. Sci. 42:295-305. Reid, W., Huslig, S.M., Smith, M.W., Manes, N.O. and Whitworth, J.M. 1993. Fruit- removal time influences return bloom of pecan. HortScience 28:800-802. Smith, C.L. and Waugh, J.G. 1938. Growth and fruiting of three varieties of pecans on different seedling rootstocks. Proc. Amer. Soc. Hort. Sci. 36:121-125. Smith, M.W., McNew, R.W. Ager, P.L. and Cotten, B.C. 1986. Seasonal changes in the carbohydrate concentration in pecan shoots and their relationship to flowering. J. Amer.Soc. Hort. Sci. 111:558-561. Smith, M.W. and Gallott, J.C. 1990. Mechanical thinning of pecan fruit. HortScience 25:414-416. Sparks, D. 1974. The alternate fruit bearing problem in pecans. Northern Nut Growers Assn.47:80-85.
foundation. Pecan Production Innovations, Watkinsville, Georgia. Waugh, J.G. and Smith, C.L. 1936. Seasonal changes in the composition of pecan roots. Proc. Amer. Soc. Hort. Sci. 34:78-79. Wood, B.W. 1988. Fruiting affects photosynthesis and senescence of pecan leaves. J. Amer. Wood, B. W. 1989. Pecan production responds to root carbohydrates and rootstock. J. Amer. (eds.). Proc. First Natl. Pecan Wkshp. U.S. Dept. Agriculture-Agr. Res. Serv., ARS-96. previous-season fruit development and post ripening foliation period. J. Amer. Soc. Hort. nonbearing pecan trees. J. Amer. Soc. Hort. Sci. 106:758-761. Wood, B.W., Smith, M.W., Worley, R.E., Anderson, P.C., Thompson, T.T. and Grauke, L.J. of fall defoliation. J. Amer. Soc. Hort. Sci. 104:192-194.
wood tissues. J. Amer. Soc. Hort. Sci. 104:195-199. Fig. 1. Linear regression of alternate bearing intensity (I) to date of fruit ripening (FRD) of several pecan cultivars cultivated over a 75 year period at Tifton, Georgia. Regressions are for: A) Ayounger trees. (age 9 to 20 years), and B) Aolder trees. (age 9 to 30+ years). R2 ’s are not significant at P < 0.25. Positive numbers for fruit ripening dates are dates earlier than the autumn equinox whereas negative numbers are dates after the autumn equinox. Fig. 2. Linear regression of the relationship of alternate bearing intensity (I) to the duration of the post-ripening foliation period (PRFP) of pecan cultivars. Regressions are for: A) Ayounger trees. 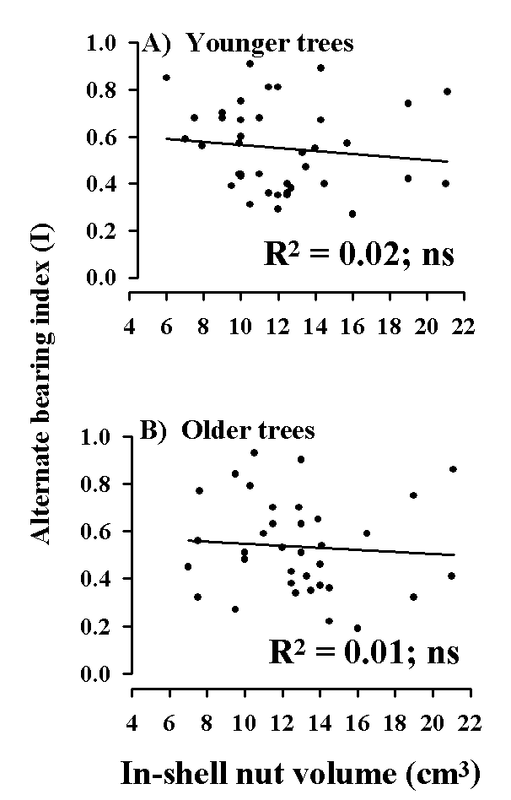 (age 9 to 20 years), and B) Aolder trees. (age 9 to 30+ years). Fig. 3. Linear regression of the relationship of alternate bearing intensity (I) to the duration of the post-ripening foliation period (PRFP) of pecan cultivars characteristically possessing large-size nuts [Alarge. = > 13.5 cm3 per in-shell nut (i.e., > Stuart). Regressions are for two tree-age populations (i.e., Ayounger trees. and Aolder trees. ; where younger = 9 to 20 years and older = 9 to 30+ years; Aall. is for both age groups combined). Fig. 4. Linear regression of the relationship of alternate bearing intensity (I) to characteristic nut volume of pecan cultivars. 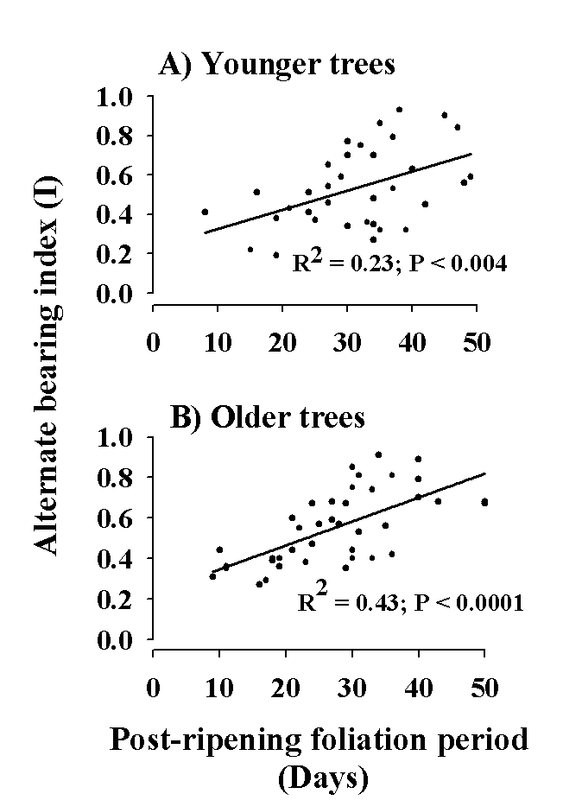 Regressions are for: A) .younger trees. (age 9 to 20 years), and B) Aolder trees. (age 9 to 30+ years). Fig. 5. 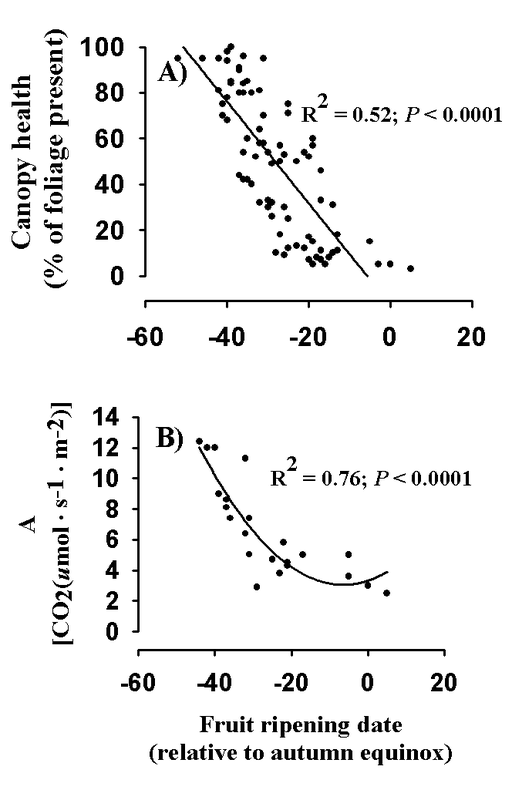 Regression of the relationship of canopy health (A) and photoassimilation (B) to fruit ripening date. Measurements were made in early November. Positive numbers for fruit ripening dates are dates earlier than the autumn equinox whereas negative numbers are dates after the autumn equinox.